As many of you may have heard, we’ve been keeping the details of our next RV a secret for a while now – an excruciating 3 months, to be exact! When we posted on our blog in July that we were selling our Airstream and looking for a different RV, we never anticipated over 10,000 people viewing that article in just a couple of days! At that time, we didn’t have a clue what kind of RV we’d end up in next. We had tossed around vague ideas, like buying a smaller used motorhome and sprucing it up a bit. Before we got too far into that process, we were sidetracked by a few unexpected emails we received from RV manufacturers, containing invitations to come tour their factories and headquarters. A couple new models of motorhomes that we viewed came very close to being our new home (more details on those in a future blog), but one in particular really piqued our interest – and quite surprisingly, too, as it hadn’t even been built yet! We talked to the manufacturer in question by phone a bit first, and they insisted that the prototype of this proposed RV was something we’d really have to see in person to get the full effect. We were willing to give them the benefit of the doubt – even without anything more than a verbal description to go on – and drove 6 hours to Decatur, Indiana to visit Allied Recreation Group, parent company of Fleetwood, Holiday Rambler, Monaco, American Coach, and retired brands Safari and Beaver. At the time, “the full effect” was a rough mockup of an RV interior, built out of plywood in the middle of a warehouse. It looked and felt more like a kids’ playhouse than an RV, and we had no idea what the exterior would look like. Immediately in love with the concept they showed us for the interior and excited about the opportunity to contribute a little in the development of this and future RVs, we decided to go for it – so we’ll be leasing the Trek for the next year. Now that we’ve finally seen it in person after three long months of waiting, our instincts were proven correct: this is one heck of a cool RV! The Trek was originally produced under the Safari brand in 1991 and has had many loyal fans over the years, thanks to its smaller size, features designed for active and outdoorsy RVers, and an adventure-seeking look and feel. It was sadly discontinued in 2008, with the Trek name later acquired by ARG, along with the Safari brand. One of the most distinguishing features of the original Trek was a bed that lowered from the ceiling in the front living area of the coach, creating a combined living room/bedroom without the use of a pull-out sofa sleeper. Not needing a dedicated bedroom in the rear, the Trek could stay under 30′ long and still have the luxury of a queen size bed with a real mattress. Those of us who live in an RV full-time or for extended periods know how quickly a pull-out sofa can become a literal pain in the neck (and back, and shoulders, and hips..)! One drawback of this layout is that it limited the living space’s usability when the bed was lowered (only problematic if one person wants to go to bed and the other stays awake) and there wasn’t a good place for guests or kids to sleep. We like to have friends and family come visit us, and occasionally they spend the night or several in our RV, so the older layout is less appealing to us at this time. Today, at the Recreation Vehicle Industry Association’s national trade show in Louisville, Kentucky, we’re so excited to be involved in the reboot of the Trek! We believe this updated model, while quite a bit different than the original Treks, will be a worthy successor. We’re so sure of it, in fact, that we’ll be spending the entire next year taking some pretty big adventures in one – from Florida to Alaska and everywhere in between – reporting our experiences and providing feedback to ARG for future designs. We’ll also be happy to show it off to anyone who wants to check it out, so if we’re in your neck of the woods please let us know! Without further ado, we’d like to welcome you to tour our new home on wheels! The new Trek has solved the bed inconvenience with what they call the Trek Room – a mixed-use room in the rear of the RV, once again featuring the signature queen size bed that raises and lowers from the ceiling. By day, the raised bed exposes a closet that stretches the entire width of the RV. There are also two dressers. The two dressers double as supports for the bed (when lowered) with space between them for a chair, so we’ll be adding a section of tabletop and creating a flat workspace that can be used as an office desk (as non-retired RVers, we’re so excited about this!) or for sewing, crafts, and other hobbies. It would also be a great area for kids to play (it would make a fantastic fort with the bed down! ), or for pets to sleep in or be crated. Another idea – and this one’s for cycling enthusiasts – is to install a stand for a bike or bikes to be stored in the RV, upright between the dressers while driving. The new Trek features a split bath, with a sink and toilet room on one side of the hall, and a shower stall with a swing-open glass door on the other. We personally love this layout, because the sink/toilet room door is actually dual-function, and when swung completely open can close the bathroom and bedroom off from the rest of the living space. You can step out of the shower with privacy, then into the adjoining bedroom, using that area as a large dressing space when the bed is raised and closets are accessible. A sliding wood bedroom door allows someone to sleep or work in the back room with relative privacy while others use the rest of the living space. The overall length is only 27′ 10″ – we’ll be able to fit easily in most parking lots and campgrounds, including those at state and national parks. There’s only one smaller slide-out, minimizing maintenance and making it easier to park in cramped areas. There’s the second Hide-A-Loft queen bed that lowers from the ceiling at the front of the RV, and the dinette turns into a bed as well – lots of sleeping options for guests! We’ll convert the dinette into a bed and line the wall with pillows to turn it into a cozy couch for movie watching. There’s also a comfy recliner up front with a reading light overhead. A sofa is optional instead of the dinette (keep scrolling for a photo). The kitchen feels residential with solid surface countertops, an under-mount stainless double bowl sink, and a chrome faucet with pull-out sprayer. Well-thought-out kitchen storage, like big pantry drawers and a pull-down cutlery drawer. Big drawers under the cooktop are great for cutlery and utensils. There’s lots of storage under the dinette as well, which is where we keep our pots and pans and small appliances. Thoughtful touches to make life easier, like this pull-out table next to the bed. The Trek boasts bus-class aluminum side-hinged luggage doors – a very nice upgrade from fiberglass, and typically only seen on high-end diesel pusher RVs. No more doors falling on our heads! The Trek Trunk, their name for the multi-functional rear exterior storage compartment, features easily accessible storage via a huge door on the back of the RV. During travel, the raised bed and closet in the Trek Room (bedroom) provides a massive amount of storage for RV tools and supplies, entertainment and patio items, adventure gear, and more. When you reach your destination, you’ll need to unload that area to lower the bed/wardrobe. We plan to use this space for items we’ll unload anytime we arrive at a campground. If we’re doing a quick overnight stop and can’t unload things outside, we’ll store those items in our car instead. Premium driver and passenger seats – very comfy! Exterior entertainment center with TV. 28″ living room and 19″ bedroom TV’s with DVD player. LCD touch control dash stereo with AUX input on the front. Hose with sprayer in the wet bay for cleaning out the bay, washing dogs, gear, etc. We’ll be working with ARG on adding some upgrades to the Trek for our preferences, like extra batteries, an inverter, solar panels, a tankless water heater, and a few other items on our wish list. While these items don’t come standard, they may become a factory option someday. For now, and mostly to keep the price lower, they opted to leave it up to the customer whether they wanted those items installed by the dealer or someone else later on (like their factory service center, who’s doing ours). Overall, we’re very impressed with the items that are standard, however, so we aren’t going to nitpick these things that not everyone would need. We’d like to extend a huge “thank you!” to all our followers for your support so far as we take on this new experiment of living in a motorhome instead of a trailer, and we hope you’ll tag along for all our upcoming Trekking! Please feel free to ask questions..and help us think of a name for our awesome new RV! Previous Post Want to Start a Blog? It’s Easier Than You Think! OMG, so cool! Very happy for you guys. The pups are gonna love it, too! Looks awesome guys!! Very practical use of the space and I’ll be curious to see your comments on real-world use in the coming months. Happy housewarming! Thanks, Jeanette! We’re looking forward to putting it to the test and of course having you over for drinks when we meet again! Amazing! What a great year ahead for you. We’re starting to imagine our “dream” RV, so we love seeing the new ideas and extras. Can’t wait for more feed back for what is working and what more you may need…or less! It looks awesome! So excited there is finally something small and smart on the market!!! The one and only thing I *don’t* like on that coach is the insistence (by so many manufacturers, on coaches of all sizes, it seems) to move the door back, then put a recliner behind the front seat, with a cabinet overhead. If you don’t have a need or desire for a recliner, that winds up being a dead space once you remove it, and the smaller the coach, the worse it is (since it’s a higher percentage of the coach overall. I’m also a reader, and I can see how that’d work out! For me, I was such a minimalist in my apartment that I didn’t have a dining room table – I ate on the couch, or at my desk – and I find the dinettes to be pretty uncomfortable with their “Yep. That’s Definitely Vertical” backrests. In the Trek, as shown, I’d opt for the current Jackknife sofa, which I might still remove and replace with a 70″ Residential sofa with a pair of recliners on the ends. OR…if it were offered from the factory…the 65″ Reclining Loveseat/Couch out of the Fleetwood Discovery 40X (with suitable upholstery for the price point of the coach), and an additional 5″ of pantry space. But…that would make the space in front of the curbside door even *more* redundant, since (as you pointed out) you could build yourself a nice little desk in the back without changing very much. Given that the largest group of RV owners are currently 35-54 years old, and that the median age of motorhome owners has dropped from 60 in 1997 to 48 in 2011 – it seems like it’s been about “one product development cycle” since the U Mich/RVIA study came out in 2011…so it’s nice to see that ARG appears to be experimenting with/implementing features for younger, more active RV owners! A residential sofa would be great! Most of the RV sofas as sofa-king-uncomfortable, if you catch my joke there. I don’t need it to be a bed, just a sofa! A diesel would be great, but to our knowledge there isn’t currently a chassis that would work well for the 27′ that this one is. We’re hoping to see something like that soon! They unfortunately build for the masses, and the masses aren’t buying 27′ diesel class A’s. We agree that the younger generation is only going to benefit from these changes! We had several people walk up and say “So this RV is for the younger crowd, then?” as if that was a weird thing. We had several people fail to understand the concept of active RVing as opposed to parking something for months at a time at one RV resort. One dealer only wanted the Trek in beige. Eventually they’ll come around, but right now the dealers are stuck as much in the traditional mindset as the manufacturers, making you wonder if it’s a chicken or the egg scenario – they won’t buy the trendy new stuff because they’re afraid of it not selling. Thanks for the link, we’ll check it out! As a future solo rv traveler, I would too would love to lose that recliner and reconfigure to kitchen in favor of a washer/dryer. I’d also prefer an L-shaped dinette. Add diesel and I’d be sold! Congratulations guys! We look forward to checking it out in person soon. Can’t wait to meet up again. How about naming her Star. Looks like a well thought out floor plan for a smaller overall length coach. I hope you enjoy her in the upcoming year. Perfect for one person! Lets hope they make a 35′. Thanks for sharing. Some innovative ideas here, the elevated bed is especially cool. I wonder if when you were dealing with them, did they talk at all about the interior styling. Given that many RV buyers are younger now than the traditional market I wonder why the manufacturers are reluctant to have more modern design inside. This definitely is better than some I have seen, but I’d love to see less wood, and cream leather and more Dwell-like styling. That would fit with the minimalist mindset. We agree, Kate! Some better interior options would be great. Thankfully with this one they kept the walls, counters, and floors VERY light, and the wood isn’t bad either. Modern looking cabinet pulls help, as well as solid colored valances and curtains – no more paisley or flowers! Yay! The new Trek looks great and I agree with the comment about the interiors, it would be nice to see some different thinking for a change. I will also be looking forward to seeing a slightly longer floorplan that would allow a dinette and a couch instead of having to choose. Another question you might be able to ask them is if they plan on having a drivers door as an option? Having two doors is a must have for us. Thanks! When will these be available for sale to the general public? What will be the MSRP? Thanks for the information. I wish I could see it in person, but I am currently deployed with big plans for RV livin’ when I return. The Trek at first glance is along the lines of what my wife and I are looking for. I will be following your posts though. This is amazing! I love the idea of the bed in the back. We’ve seen the older Trek’s and wouldn’t work for us. I am so glad RV manufacturers and listening and have incorporated work space into it. Looking forward to following your travels in the RV. Sweet rig! Let us know if you pass through New Mexico, we’ll have you over for some co-working! Still have not seen a photo anywhere of what that space looks like from the rear with the bed up. Wonderful blog post! I understand why you’re so excited. This is an amazing RV! I’m thinking I just don’t understand the Trunk though. Does that huge access door just open directly into the back of the bedroom? Or is there actually a separate storage compartment? Do you have another pic showing it open instead of just the TrekTrunk sign? Also wondering about the mechanism to raise/lower the bed. I assume it’s an electric lift. They’ve done a great job of concealing the mechanism. Is there a manual override in case it get’s stuck in the up position? Would really be unfortunate to be halfway across the country and have no access to the main bed. Finally, what does the dealer network look like? I found the one page web page at http://www.trekmotorhome.com/index.asp Glad it’s there, but it definitely doesn’t provide much info at this point. Anyway, thanks for posting. I’ll definitely be following your adventure! The Trunk is a storage bay lined with a felt-like carpet that’s under the bedroom closet, with a rubber seal around the top corners to keep bugs and heat/cold out of the bedroom. When the bed is lowered, both it and the closet lower together, and the closet fills the Trunk. Think of it like a vertical slide, just it’s the closet sliding into the storage bay. If you opened the Trunk door on the back when the closet and bed are down, you can only see the back of the closet. I’ll be sure to take a video of it when we pick it up! We nicknamed it “the car crusher” because you can’t leave anything in the storage area when you lower the closet. The mechanism to raise and lower the bed does have a manual override, and it’s in the closet next to the bed. They’ve been using this system for a while on their Hide-a-Loft beds in the front of the coaches (which the Trek has too). We’ve heard people who owned the older Treks recommend carrying an extra motor “just in case”, but we’ll price those and get our hands on a manual to see how hard they are to service ourselves should something happen. The dealer network is just being formed – the Trek is in production now and should be at dealers soon. Because it has been split out as its own brand, a dealership doesn’t have to already sell Monaco, Holiday Rambler, Fleetwood, etc to sell the Trek. You may even be able to ask a local dealer if they would order it or carry the line. If you have specific questions, we can pass them along to the manufacturer for you. We saw quite a few dealers signing up to carry the Trek when we were at the industry trade show, so hopefully you’ll start seeing them on lots soon! If we’re close to where you are let us know and we’d be happy to let you see ours! Thanks for following and hope to cross paths sometime! Ah, I understand now Kristin. Thanks! Went back and looked at the video. Had not noticed the mirrored doors on the closet moving up and down as well. That’ll take some planning for sure, but it is a useful feature. I’m looking forward to hearing how well it handles in traffic and cross-winds. It has a relatively short wheelbase/length ratio. Up to now, we’ve been considering the Winnie Aspect 27D Class C. It has a very similar floorplan with the bed lift system, but I think I like your floorplan better. The Aspect is a couple of feet longer but it has a significantly higher wheelbase ratio (axles further apart). I’ve read many accounts that it handles very well and they point to the long wb as an important factor. No problem! We have a very similar wheelbase/length in the 28′ Fleetwood Storm that we’re borrowing right now, so I can verify that it can be a bit hard to handle in the wind, but it has a pretty impressive turning radius on the Ford chassis. Every RVer we’ve talked to says the same about theirs being difficult in wind, so I don’t know if it’s any worse without driving other RVs in similar conditions. Obviously a heavier RV like a diesel pusher will handle a bit better just because of the added weight. The potenetial for a pass thru from the back of the Trek into the bedroom would be fantastic. We kayak and the thought of loading the kayaks from the outside once the bed is raised to the ceiling is a very appealing option. I believe Airstream had a rear trunk door many years ago. I love my Holiday Rambler Traveler (Trek’s cousin) but the new Trek has some options which are appealing. Happy Travels in your new rig. Hope the power is sufficient for those steep grades out west. This looks like a wonderful choice for your you guys! When you come to Alaska, please be in touch with us. We can hopefully advise you of some of our favorite places we visit with our Airstream, and share some time. Hi Kristin: Thanks for your blog. We saw this unit at the GS rally in PHX. We have owned a 92 28ft Trek(Isuzu 4cyl Diesel) before retirement. Slow turtle uphill. However, this 2015 Trek is a much improved unit. I cannot see how the wardrobe/bed will work in real life. Seems like one will be raising and lowering the bed several times a day..maybe not? Good to have a manual override. Diesel vs Gas: Be happy this is a gas unit. The costs for a diesel with todays regs would be high. The gas is much more practical for overall costs and general operation. Need more power? Try a chip. We have a 40 ft mid door Safari 350 Cummins with propane injection. Believe me…the gas unit is a no brainer. Check out the torque levels. Yes, more grunt on the diesel at the low end, but climbing the hills the gas wins on RPM. I know this discussion could go on, but the point made earlier is the price from the MFG has to align with the buying public. Good Job on the TREK. BTW, if someone wants a diesel(read more $$), then look at the TIFFIN Breeze in a 28 or 32 foot unit. I have driven the 32 ft model and it handled great and drove like a van. However, a different cost level. The one overdone furniture mistake on the TREK is the recliner! Saw this at the show and I remember the early 2000 models from Monaco having the same oversize recliner. Takes too much room in ANY MH. It needs an Ekornes recliner. I have had short wheelbase units that were tricky in the wind. However, one doesn’t have to travel in very windy conditions. The ride quality in directional stability can be minimized by weighing the coach and setting the tire pressures to spec for the load. I can’t remember if this new TREK has Michelins as std equipment. If not, I would insist on the Michelins. My neighbor bought a new Winnebago 27 ft gas unit and had all sorts of handling problems. No one, including the dealer, ever checked the tire pressure. Of the 6 tires 4 were way under or way over. After the correct tire pressure was set the MH was spot on. The basics are important especially on a short wheelbase unit..
My full time friend really liked the new TREK at the GS rally. He is looking to downsize and not give up the lifestyle. I know he has many more miles in MH’s than I do and his opinion shows some insight. Will be anxious to see how your travels work. I think the SAFARI CLUBS would be interested in your travels, too. Safari International in the FMCA would be a good start. Have fun with the journey and thanks again for the Blog! We find that since we use the wardrobe for hanging clothes but keep our socks/undies/coats/shoes and other necessities in the side wardrobe and dressers, we only raise and lower the bed once each per day. We use the back room as our office, so the bed is up all day, and that gives us full access to the closet. We are very happy with the gas RV. In addition to cheap gas right before our huge drive to Alaska, it’s pretty easy to get a Ford engine worked on by nearly anybody, and to find parts if need be. So far we’ve been happy with the power – obviously we’re not going to win any races uphill while towing a Jeep Grand Cherokee, but who will besides a diesel pusher? We just installed a Safe-T-Plus steering stabilizer to help a little with the extra “play” in the wheel and sway that we didn’t like when being passed by trucks. It’s still a harder drive than a big rig because of the short wheel base, but we can hold the wheel now one-handed with the steering control added. We have a blog coming soon about all the modifications we’ve made so far – stay tuned! We have Goodyear tires on the Trek and they seem to be okay for now – we check them constantly with the tire pressure monitoring system that we installed. We still need to get the coach weighed fully loaded though and make sure we’re good on our pressures, given the distribution of weight on the axles. We looked at the Tiffins but didn’t like the floorplans at this stage in our lives. For now, we like having that extra room when the bed is raised to have a real office or desk for hobbies and crafts. At 27′ we can go almost anywhere, and have even done a U-turn on a two lane road a couple times! Gotta love that Ford turning radius. The recliner is pretty big in this one, yes (much to the dogs’ pleasure! ), and we might be tempted to replace it if we were going to be living in it for a long time. The nice thing is, it’s only attached to the floor by a small bracket with a knob that you unscrew to position the recliner in different places within the coach, so it’s an easy switch if you don’t want it and desire a different chair, a second desk, a cabinet, etc in its place. Smart thinking on their part – it really is an easily customizable RV. If you did the jack-knife couch instead of dinette (a factory option), you wouldn’t even really need a slide at all. We’ll be sure to look into the Safari club – we’re thinking of attending a Trek club rally up in the Pacific Northwest this spring too. Thanks again for the follow, and stay in touch! There’s one bay that has some pass-through space. We can fit a couple folding chairs stacked on top of each other in that area, so it might be big enough to lay the clubs on their side, depending on how big your bag is. We don’t carry anything bulky except our bikes that are on our hitch, and two inflatable stand up paddleboards, which live in the cargo area of our Jeep most of the time, partly because it’s more secure than storage bays on an RV. That is one gorgeous RV. Do like the recliner and the pantry storage. Where is the generator? The generator is on the driver’s side, under the slide in the second bay from the front. We haven’t used it much yet since we have solar for most of our needs. What is the weight capacity for the loft bed? While it’s pretty… I am seriously disappointed. I was hoping beyond all hope that the new Trek would be a narrow body, 25 foot or less, with a height of no more than 10’6″. While it would be nice to have a back bed area… I don’t want to give up kitchen functionality, let alone a nice living area. The main reason I even want a motorhome is due to dietary restrictions… I have to have a great kitchen with a microwave/convection that isn’t mounted so high that I can’t see inside the microwave. I am 5’3″ tall. I want a class A, that is short in length and height. I would like to be able to travel back roads throughout our great country… sightseeing! I don’t want a class b or c. I love the spaciousness of a class A. I love the early Safari Treks.I would rather dump major bucks into refurbing an old narrow body Trek and get what I want. I am in the target age group for the market. I just don’t want to camp along the Interstate. I want to be able to easily drive through a neighborhood… park in a driveway, turn around easy, be able to find a campsite, Drive through the city streets of Chicago, Seattle & Toronto (to name a few) without any issues! We’re looking at Class B’s next because they’ve come a long way with the interior layouts on those. Some of our new favorites are the Leisure Travel and Pleasure Way vans with a murphy bed. It has a good sized kitchen and bath, and a living room/bedroom where you don’t have to tear down the bed every day – just remove your pillows. Neat concept! The Pleasure Way especially, because it doesn’t have a slide, and is great for street camping. I like what your company has put together for 2016, I will be buying my net motor home within the next two months, I would like to have a current color brochure of your Trek motor home, if it possible, plus a ball park figure on your 29 ‘ unit. Hi Lou! You can head over to http://trekmotorhome.com/ to find a dealer and fill out a form to request more information. We aren’t the manufacturer, we’re just RV lovers like yourself. 🙂 Good luck with your motorhome search, and let us know if you have any questions about our experience test driving one to Alaska. I’m primarly looking for a very short diesel pusher. How does the Trek handle with cross winds and passing semis? Do the ruts on some of the interstates cause it to “hunt”. I’ve been to Alaska many times in a truck camper and I’m looking for something with more accommodations. Thanks, that ties in with what I have experienced. I’ll probably look more closely at the Country Coach 37′ with the tag. Tag only because it offers better straight line performance. We live South but spent much of our time in the NW. Much of in spent in Alaskan Camper, for obvious reasons, but need a little more room now. So far I like everything I see and read about the new Trek. There is one piece of information I cannot find. What type of roof does the coach have? Is it fiberglass or rubber? Thank you and enjoy your time together. Hi Dewey! The roof on the new Trek is fiberglass. Let us know if you have any other questions about it – it’s a nice RV, and got us to Alaska and back last summer with no major issues! 🙂 Happy travels! I was told by an agent at the Monaco display area at the FMCA rally in Perry, GA in March that the 2016 Trek production had ended soon after it began. He told me I might be able to still find a new one on the lot of a few dealers because they didn’t sell well. He offered to show me what he had but I told him that as a Trek owner, I wasn’t interested in seeing anything else. I understand a survey was done among previous Trek owners but the 2016 offering failed to incorporate any of their suggestions and none of them were interested in trading down to this new offering. 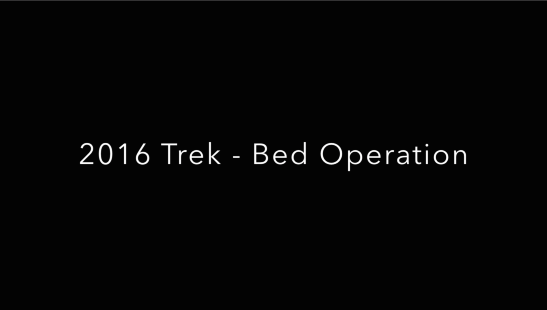 If you’re looking for one of these 2016 Treks, better hurry or resign yourself to looking for a slightly used unit. Hi Donald! We’re no longer traveling in the new Trek – it was a lease from the manufacturer to evaluate it for them, and unfortunately I haven’t heard any news from them since returning it, regarding their plans for the model going forward. There was an opportunity for them to make some really great modifications to make it more like the older models, but it sounds like they won’t be giving it the chance. 🙁 It’s a shame – we really liked it, other than a few issues we pointed out in our review here, and we made a lot of recommendations based on our year living in it. The sad fact is, the industry usually caters to the lowest common denominator so they can sell a lot of units at the highest margin, not to the niche markets, other than super high-end and high-dollar coaches. It was too narrow of a market for them to keep trying, it sounds like. Hang onto yours, and hopefully someone in the future comes out with something more similar in the future. That’s why we just moved over to a class B, for the innovation and quality that seems to exist in that market, versus the class A’s of recent years. Thanks for your comment! The Trek offered much of what we’re looking to buy in 2 years and was so exciting to see through your practical description. I’m so disappointed to see it scrapped, way too soon. The new trek was so short lived, it seems there was no corporate commitment to build fans over a five year plan. Speaking of five year plans, traditional manufacturers need to decide who creates the five year plan. If they are dictated by distribution, just engrave the tombstone now and be done with it. Distributors aren’t forward thinking. The RV industry seems to operate as if it’s immune to modern life. Hello RV manufacturers! Coffee shops were near extinction, now they aren’t. Take a lesson. Invest, modernize and commit to a brand and life style awareness, There’s an untapped market ready and another one that doesn’t even know about the possibilities. Btw, I’m 50+ yo and have cash. No desire to park long term or slow down. I want a rig that allows my husband and me to live on the road. Can you bring it or are you committed to the slowmo? Snowmads, thanks for the info!